Ready to start building the pool of your dreams this spring? Make sure you hire the right NJ tri-state area pool contractor for your job by following these important tips. If you are ready to take on the home improvement project of designing or installing a new pool or want to renovate or update an existing pool and the landscaping, a seasoned pool contractor can help you with the design and make sure that the project goes as smoothly as possible. A swimming pool contractor is responsible for overseeing the building and repairing of pools, by itself a big job. But, did you know a pool contractor is also responsible for installing the equipment needed to keep the pool maintained and equipping the area with safety devices to protect you and your guests? Pool contractors that are experienced with landscaping and home renovation will be a better choice than contractors who are only skilled in one particular line of business and do not possess the knowledge to consider the many elements of a pool project. These elements include the backyard living space, patio work, electrical work and landscaping. A swimming pool contractor also needs to be able to work with pipes, filters, valves, lines and pool heaters, all potential parts of a swimming pool in the New Jersey tri-state area. Some of the potential questions that may come up can only be answered by a pool contractor that has experience with landscaping and home renovation. For example, a pool contractor needs to know what to do if water is hit while digging, if there is patio work that needs to be done, or if rock is hit during digging. A good pool design is one that weaves itself into your existing landscape. Many people will redesign landscaping in order to accommodate the new or renovated pool. However, a pool’s design needs to take into consideration the specific regulations and building codes in your area. A good pool contractor will work with you to design the best use of your space for a new or existing pool that is within code. By thoroughly researching and hiring a professional swimming pool contractor, you will save yourself potential pitfalls and will end up with a pool that is certain to bring enjoyment to you and your family for years. 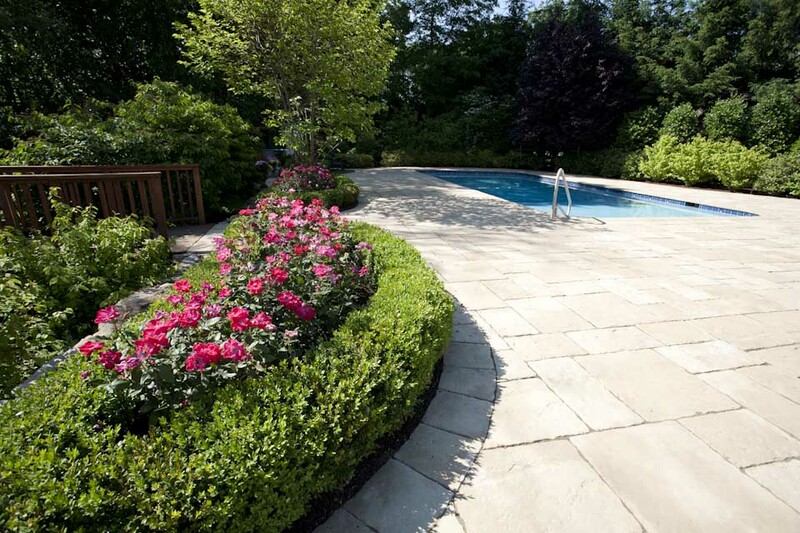 Thomas Flint Landscape Design & Development has earned the trust of property owners over the last decade as the go-to source for swimming pool construction in the New Jersey Tri State area. You can look at our portfolio to see the NJ tri-state area swimming pools we have built or renovated. See what past customers have to say about the work we do, and contact us today to receive an estimate. Thomas Flint Landscape Design & Development is a Ramsey, New Jersey landscape company that specializes in landscape design, planting, outdoor lighting, paver patios and walkways, outdoor fireplaces, custom swimming pools, pool renovations, and more for people in the New Jersey tri-state area, including New York and Connecticut. With hundreds of projects completed, Thomas Flint has some great imagery, but here is what our clients are saying about our work. Just writing to express my thanks for a fantastic job well done by the team at Thomas Flint. It was definitely a pleasure working with Tom and the team there. From the initial start of the requested project through the end everything went as planned and we could not be more pleased with the outcome. Not only was everything completed much quicker than I had expected, it was done thoroughly. I look forward to working with Tom and everyone again in the near future! Thanks so much for all your hard work in transforming our backyard. We were able to have a wonderful Mother’s Day barbecue on the patio, and the new plantings and grass looked great. Thanks again. Keep up the good work around town. I’ll be sure to refer you to all who ask for a top-flight landscape design team! Every landscape creation begins with an in-depth understanding of the customer’s requirements. We integrate our architectural and design expertise with your personal goals to produce an outdoor space that complements your lifestyle.